For winter holiday happenings, Consumer Rental owner Michael McDaniel wanted something a little different from the usual, so he turned to Landmark Creations to design a Norman Rockwell–themed Santa Claus. The jolly elf is dressed in his iconic red suit and green gloves, and he stands 25 feet tall. He towers over the crowds for an eye-catching display that can't be missed. 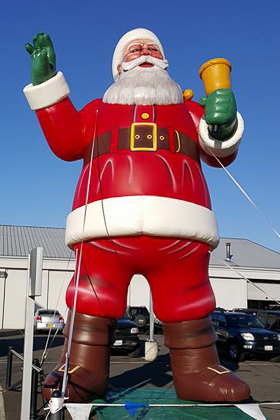 The inflatable Santa Claus is the perfect addition to a holiday parade float, carnival, trade show, or grand opening, and has already been spotted greeting customers at the local Dodge dealership. We're sure he'll get plenty more exposure as word gets out about this fun inflatable character who's available to oversee local gatherings of any size.